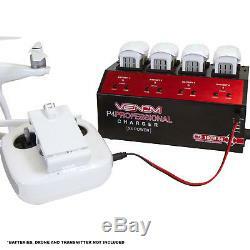 DJI Phantom 4 Venom Pro Charger 4 Channel (100W X4) Rapid Speed Battery Charger. DJI Phantom 4 users rejoice! 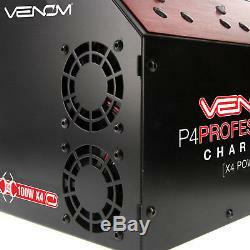 Venom has you covered with our P4 Professional Charger. 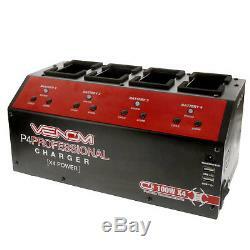 The Venom P4 Professional battery charger is designed to charge, cycle, or storage charge up to four DJI Phantom 4 batteries simultaneously. That is right, all four batteries get charged at the same time, unlike most other multi-battery Phantom chargers on the market that only charge one battery at a time. Spend more time flying and less time charging. Featuring a sleek 4 bay design, this charger saves valuable bench space by providing four complete charging circuits. Each bay contains its own dedicated 100W integrated power supply in a space saving footprint. Having four dedicated power supplies in one compact package means all four channels are able to receive 100W of power, ensuring you are not diluting your amp rate when charging a second, third or fourth pack. The Venom P4 Professional Charger is also equipped to handle the charging needs of the Phantom 4 transmitter, by way of convenient 2.3A USB (x2) and DJI (x1) transmitter charger ports located on the front of the charger. Power up fast and keep your Phantom 4 in the sky longer with the Venom P4 Professional Charger. 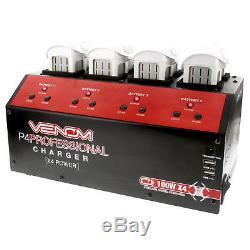 We are certain of the quality of all Venom products. We reserve the right to substitute different sizes or types of replacement product for product sizes or types that have been discontinued. Included Charge Leads: Phantom 4 Transmitter. Lithium Cell Count: 3 Cell. Charge Current: 4 x 6A. 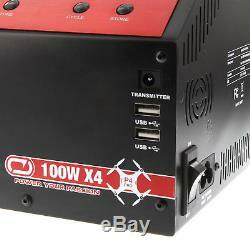 Circuit Power: 4 x 100W. USB Output: 2 x 5.3V 2.3A. Radio: 17.3V DC 2 Amp output / 17.5V DC 5.5 Amp Max. Customer feedback is very important to us! Negative or Neutral feedback is not necessary as we are here to assist you with any concerns if something comes up. Just give us the chance to assist you so that we can keep a clean record and continue to offer outstanding products, prices and customer service! We do not mark packages as Gifts. If a component is defective or was not correctly made, Atomik RC will, at its sole discretion, repair or replace the item free of charge. Release of Liability: Atomik RC it's affiliates, manufacturers, distributors, or retail partners shall not be held liable for any accident, injury to persons, or damage to property resulting from use, misuse, or abuse of any Atomik RC product. In purchasing a Atomik RC product the user agrees to accept responsibility for all such risks. The item "DJI Phantom 4 Venom Pro Charger 4 Channel (100W X4) Rapid Speed Battery Charger" is in sale since Wednesday, June 20, 2018. This item is in the category "Toys & Hobbies\Radio Control & Control Line\RC Model Vehicle Parts & Accs\Control, Radio & Electronics\Chargers". The seller is "atomikrc" and is located in Rathdrum, Idaho. This item can be shipped to United States, all countries in Europe, Mexico, Japan, Australia, China, South Korea, Indonesia, Taiwan, South africa, Thailand, Hong Kong, Bahamas, Israel, New Zealand, Philippines, Singapore, Saudi arabia, United arab emirates, Qatar, Kuwait, Bahrain, Malaysia, Costa rica, Panama, Trinidad and tobago, Guatemala, Honduras, Jamaica, Antigua and barbuda, Aruba, Belize, Dominica, Grenada, Saint kitts and nevis, Saint lucia, Montserrat, Turks and caicos islands, Barbados, Bangladesh, Bermuda, Brunei darussalam, Egypt, Guadeloupe, Jordan, Cambodia, Cayman islands, Sri lanka, Macao, Martinique, Maldives, Nicaragua, Oman, Pakistan, Reunion, Viet nam.